Kathua April 08: Sh. 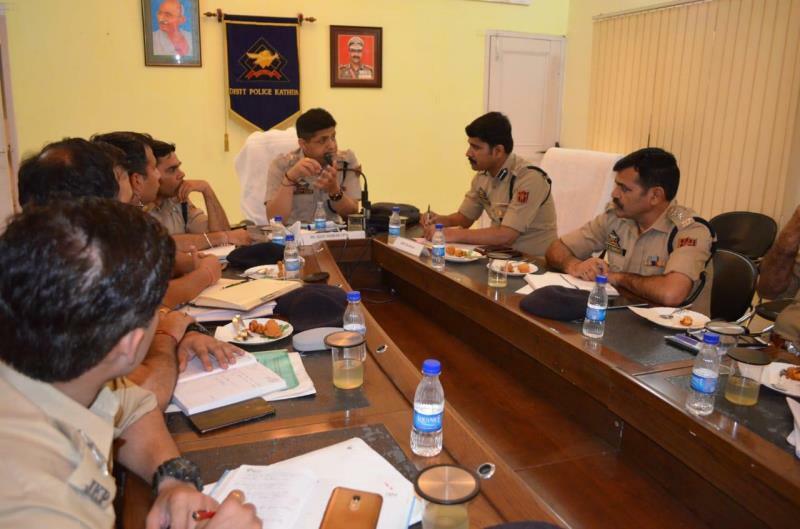 Sujit Kumar Singh IPS, Deputy Inspector General of Police, JSK Range, today visited Kathua to review security and Elections preparedness in view of Parliament Elections 2019. Sh.Shridhar Patil IPS SSP Kathua, Sh Ramnish Gupta Addl SP Kathua and supervisory officers were present in the meeting. At the outset SSP Kathua briefed about the security scenario of the district, measures adopted to strengthen security grid and elections preparedness. DIG JSK Range during the meeting issued directions to strengthen Border security to neutralize any attempt from across the international border. He emphasised for prompt sharing of information among sister agencies and Inter-state bordering district as well to maintain high alert in view of VVIP visit and election in the district. Besides, DIG JSK also reviewed election preparedness and stecurity arrangements for free, fair and smooth conduct of elections and advised measures to deal it amicably and effectively. Meeting concluded with vote of thanks and resolve to serve people better.